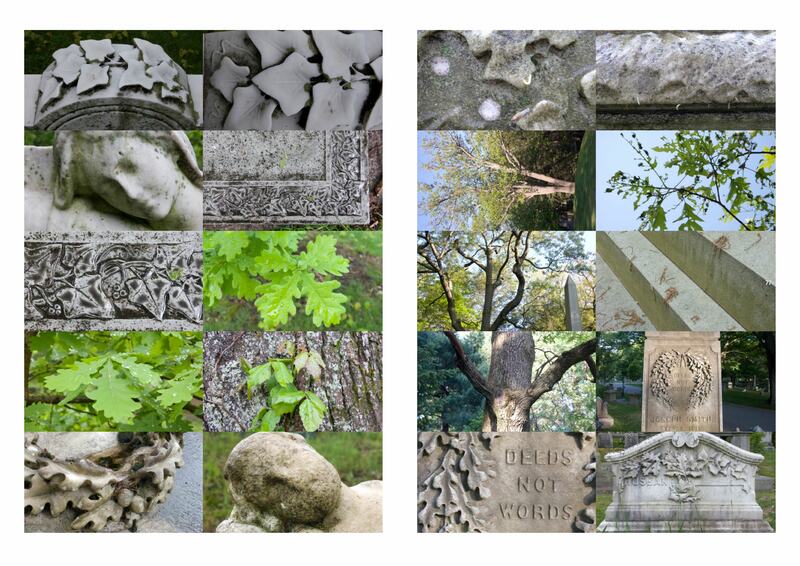 Elaine Sexton: Your photographs, what you call “investigations,” were first exhibited at the Art Institute of Boston with the curious title, “Interesting & Dull Shapes,” all taken in the historic Forest Hills Cemetery, founded in 1848, on the outskirts of Boston. A book/catalog containing the larger body of work, 1,600 images, digital photographs, accompanied the exhibit. Would you explain the title, which suggests that shapes we will find in your work are both interesting and dull, and how it relates to this body of work? JOHN KRAMER: First, I should say that I used to live right next to that cemetery and also that I have a large dog. I had spent a LOT of time in it before I made a single picture. 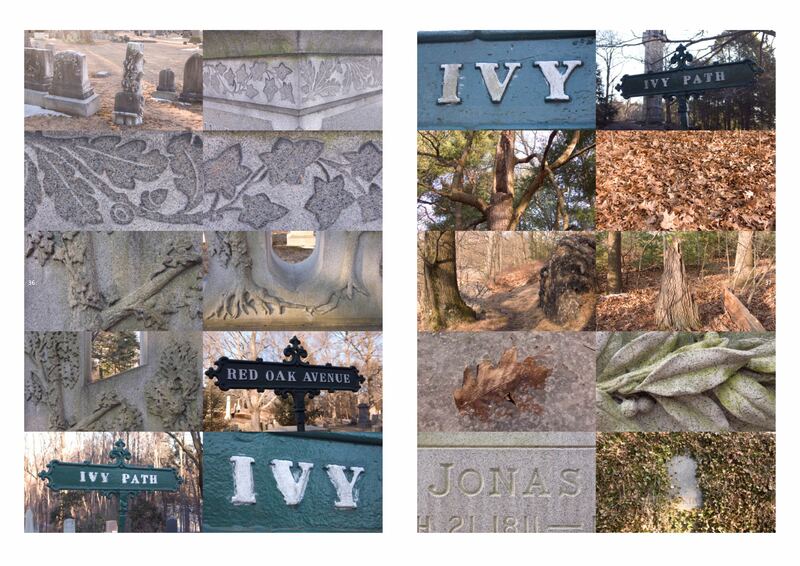 My personal name for the project was always “Oak and Ivy” because of the curious prevalence of oak and ivy leaves as decorative symbols on the grave markers. It’s why I picked up the camera in the first place. Soon after beginning the project, I became aware of actual leaves from living specimens of oak and ivy, and became fascinated by the striking contrasts between the organic and carved versions. Sometimes both appeared in the same frame. As a graphic designer by trade, it made me ask: why repurpose natural forms as symbol and decoration, and what does it mean to make them more aesthetically pleasing/uniform/flawless/”interesting”? ES: What our readers see here, online, is only a small selection of a large body work in the shape of the actual pages, spreads (i.e. two facing pages), from the catalog/book, which is the true embodiment of the work. I understand these photographs appear in the order in which they were taken, so the “composition” is more organic, editing, rather that juxtaposing images on the page in a more staged way. JK: I often wonder which of my decisions come from conviction, and which from evasion. This is an example of both, I think. The book is made up of nearly every photograph I made. (I removed most of the verticals, some near-duplicates, and some that were very poorly exposed, and most of the ones featuring Carmela, my dog.) If I had had to “compose” the book, design individual pages, etc., then first, it would never have been completed, and second, it would be making hierarchies and relationships that I was not then ready to make. I don’t consider myself a photographer; more like a visual note-taker. When the work was shown, I was asked to make enlargements of some of the works to be available for purchase. 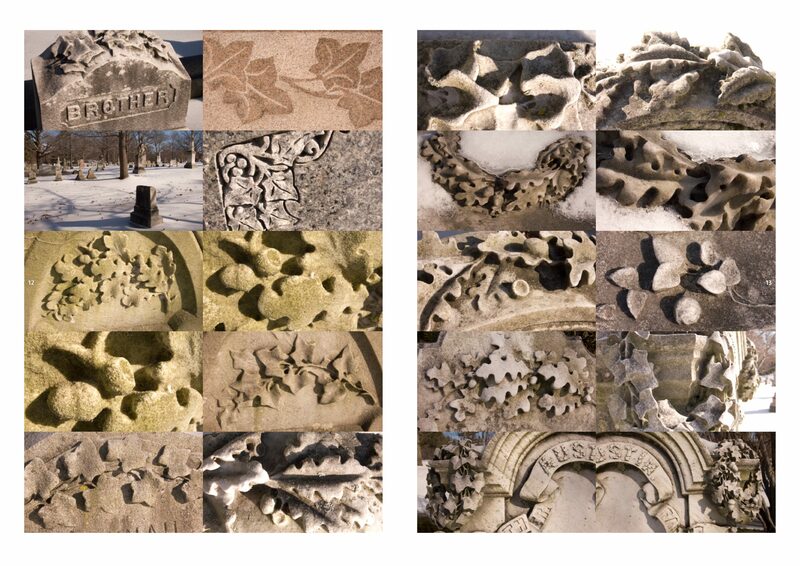 It was an interesting problem, figuring out which frames could stand on their own, in diptychs or triptychs. For me, the main component of the show was a slide show at the back of the space. Unlike the book, which because of its chronological arrangement has a diaristic quality, the slide show displayed (nearly) every image, but one at a time, in a random, never-repeated order, with videos interspersed. Both slideshow and book employed systems which created their own meaning — by proximity in time in the former, and time-and-space in the latter. 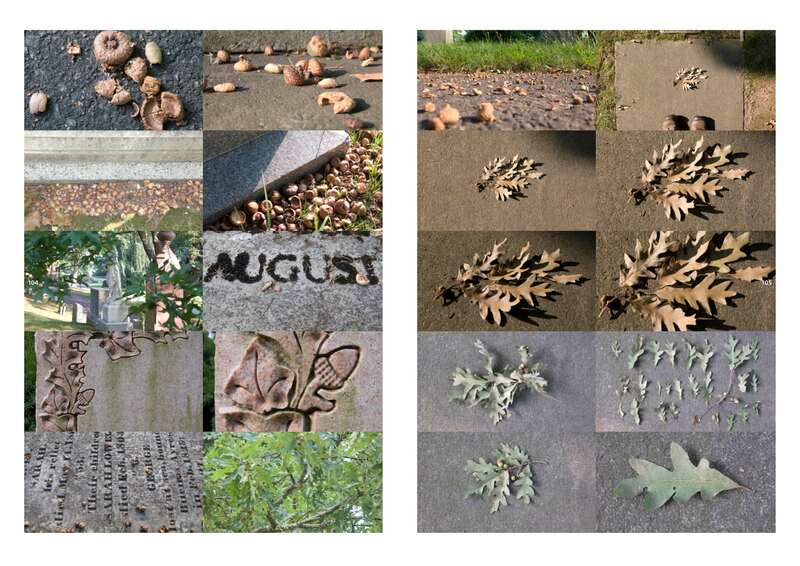 ES: In an earlier work of yours called “Dailies,” (HallSpace Gallery in Boston, in 2005) 4400 photographs from the Arnold Arboretum, were exhibited not as a book, but as an enormous grid on one of the gallery’s walls. Clearly, what you call “multiplicity and overabundance” informs your art making. What is it about seriality and overabundance appeals to you? JK: This is related to the conviction/evasion I mentioned above. My use of multiplicity and abundance serve to de-emphasize the perfect, solitary image, and to evade the effort that trying to produce such an image would entail. Additionally, conveying “truth” through pictures is futile, as we know, but I cling to the notion that with respect to representation, more is more — especially when more approaches all. This is something I am also attempting to do with my own portfolio website. Rather than a collection of easily shareable, “best-of” works, I plan to include everything I have ever made as artist or designer. Maybe I am one percent of the way to achieving a sense of what that much content would look/feel like. ES: We are featuring here a video made up of still images, “Names Are Words,” that you have modified for this site from its original form. Would you put the selection of these images in context? JK: While working on this project, I started to become aware of surnames that were also common nouns. While these photos have no relationship to what became the main thesis of the work, I found they created a kind of list poem with three-dimensional typography that I found irresistible. The video was originally created for “ThisThatShow,” a multi-disciplinary event curated by my husband and occasional collaborator, Daniel McCusker. I created the sequence to accompany a short piece of music that was performed live. The video wanted a narrative arc — not a chance arrangement for a change! — so I grouped the words by category: adjectives, landscape features, animals, and professions. I should add that the exhibition also included a mirror with a cast-iron frame of ivy leaves, a set of relief prints made from a series of stones that I had etched by a gravestone maker, leftover bits of gravestone manufacture, and a framed photo of a color-inverted oak leaf that is an homage to my touchstone throughout the project: scientist/inventor William Henry Fox Talbot. A viewer will see this work on my site.